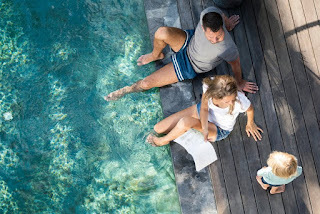 Swimming pools are meant to be fun, however, even though they are an opportunity to have a great time, there’s a lot of danger involved when owning a pool. It’s hard to watch, but every summer, we see stories of children who drowned in their family’s pool, and what makes these events all the more tragic is that most of them are 100 percent preventable. If you’re building a pool or doing a pool renovation on your current pool, you should consider adding some safety features to protect your kids and pets. In this article, we’re going to look at a few of the safety features you should consider adding to your pool. Having a good, secure fence helps keep unsupervised kids out of the pool. However, not all fences are the same, and not all of them offer adequate protection. Installing a wood or metal fence can be effective, but it permanently changes the look of your property, and they can be expensive to install. Instead of going through the hassle and expense of one of those, consider adding a removable pool fence instead. A removable fence can be just as effective as the permanent fences, but it can quickly be taken down once the swimming season is over. A pool net stretches over your pool’s area to keep out kids and pets. These nets are easy to install, and they come in a wide range of colors that you can match to your backyard decor. Most pool nets take about five minutes to remove and ten minutes to put back, which isn’t that much time when you consider that it can save the life of your child. It’s frightening, but many times, people find that neighbors or strangers have come onto their property to use their pool, either while they’re out or while they’re sleeping. Installing an alarm is an excellent way to ensure that no unauthorized people use your pool. There are several types of alarms to consider. - Surface to Wave Detection Alarm Waves splashing triggers this alarm and can alert you when a child or animal falls in the water. - Sub-surface Detection Alarm This alarm sits below the water’s surface and alerts you to when there’s a sudden change in water pressure, which can indicate someone has fallen in. - Pool Immersion Alarm This is a popular alarm system that uses a sensor and wristband or bracelet and alerts you when the bracelet becomes submerged. This is a great system for people who have kids or pets that are often unsupervised. - This alarm is straightforward and works like your alarm in your house. When your door or gate is opened, the alarm sounds. While there is a multitude of safety devices you can get for your pool to ensure everyone has a fun and safe swimming experience, these are the most common and should get you started in the right direction. Follow these steps and you will be on your way to no worries, during a nice day by the pool deck.